In the current global economic conditions, effective management plays an increasingly important role in the steel industry. As changing environment stimulates evolution in the steel industry, professionally managed organizations turn to innovation management in search for vital components of effective strategies. With rising threats and uncertainties, an organization in the steel industry requires effective innovation management strategies to ensure that their position does not weaken in the industry. There is no standard definition of innovation. One can find several definitions in literature. Some examples are given below. Innovation means new, so far not known method for fulfilling new kind of needs. Each idea, proceeding matter which is new, is called innovative, because it is qualitatively different from hitherto ones. Innovation is the new competitive arena where present-day gladiators, equipped with similar information and access to similar resources, try to outsmart one another to victory. Innovation calls for the integration of different technological and organizational knowledge inputs that are often derived from other organizations and other regions. It helps meeting the unmeant users need through creativity and problem solving. Innovation also differs from improvement. It refers to the notion of doing something different rather than doing the same thing better as being done during improvement. Innovation is what is desirable to the user. It is visible to the other people and it is not an idea but what is possible to implement with technology. 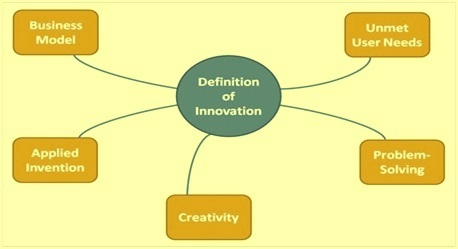 These characteristics of innovation are shown in Fig 2. 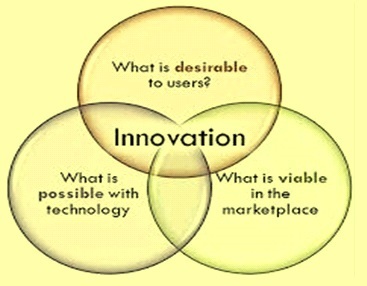 The process of innovation can be divided into three stages namely (1) invention of novel idea beginning with recognition of market/user needs, (ii) idea development, and (iii) idea implementation, or the adoption and diffusion of the innovation by users. The innovation process ends, when the innovation is adopted and implemented by the organization, or when the resources run out, or when environmental opposition prevails to terminate the developmental efforts. It should be pointed out that organization cannot gain competitiveness in the maturity stage of innovation process. In order to do it, it has to encourage employees to seek for continuous improvements and new brilliant ideas. Innovation takes place continuously in every field all the time. It takes place due to the necessity or desire to do things in a different way to achieve better results. It is done for improving the techno economics of the process (improving yields, reducing energy consumption etc.) by making the process more efficient. Through innovations organizations can meet the revised and improved regulatory norms and can upgrade the products to meet the tighter product specification from the customer. Innovations take place mainly in the areas of material development (It include both input material and product), and process development (It include production, heat treatment and other auxiliary processes). Developments in technology and processes, in input materials, for overcoming energy and environmental concerns and for enhancing the reliability in product quality are some of the important areas for innovations. Innovations in technological processes take place to achieve the following objectives. Innovation can take place in the form of new process that replaces old process. Example are converter steel making process replacing open hearth process, continuous casting replacing ingot casting and blooming and slabbing mills, dry quenching of coke replacing wet quenching of coke etc. Innovation can also take place in the form of small changes/addition to the process without changing the basic nature of the process. Example are introduction of bell less top and pulverized coal injection in blast furnace, introduction of combined blowing to converter steel making, introduction of slag splashing to improve converter lining and introduction of no twist block in wire rod mills etc. Innovation can be in the form of development of new products that have superior characteristics and replace the old products. Examples are TMT rebars replacing CTD rebars, ductile iron replacing malleable iron. It can also be in the form of incorporating new characteristics in the product making it superior to earlier product. Examples are weather resistant steels and micro alloyed steels. Development of advanced high strength steels (AHSS) for automotive application to support the weight reduction program of the automobiles is one of the finest examples of the product innovativeness in the steel industry. The long term goals of steel industry are (i) zero accidents, (ii) zero product defects, (iii) 100 % reliability in all its operations, (iv) retaining present productivity gains and further improving upon it, and (v) securing new and existing markets based on new products and a reputation for quality and delivery. Achievement of these objectives requires a strong innovative culture in the organization besides a strong planning in every field of activity. Innovativeness is important for an organization. It can generally be stated that management of innovations in an organization in the steel industry has the following characteristics. The creations of conditions in the organization are necessary that stimulate the development of Innovation such as information and knowledge. The manifestation of their development is the generation of new ideas and the effectiveness of processing them into marketing, organizational and financial innovations. Innovation has always been important in steel and steel industry has a strong history of innovation in technologies, processes and industrial practices. If one examines the huge field of production processes, then the challenges lie in continuing to optimize the process chain as a whole. As the steel industry has already made major improvements over the past decades, the future will tend to see smaller but significant optimization. The main task is to combine and coordinate the individual process steps better. Steel industry’s constant drive for innovation, for exploring new, more competitive and cleaner ways to make steel is the steel industry’s signature to making steel to meet the ever changing requirements of the steel consuming industry. Innovation and technology have transformed steel industry into one of the world’s most competitive, sustainable and environmentally progressive industries. The industry invests substantially in new technologies and better processes to make the steel more innovative, less expensive and stronger than ever. These investments pay dividends. More than half of all types of steel did not exist 20 years ago. Steel industry has also significantly decreased the environmental footprint. Today the steel industry’s greenhouse gas (GHG) emissions have been cut with reductions GHG and energy use per ton of production in emissions intensity. While impressive gains have been made, the pressure to continue to innovate is never ending, especially given the strong international pressures faced by the industry. It is essential that organizational management support continuous innovation in their organization since this has become necessary for survival today.